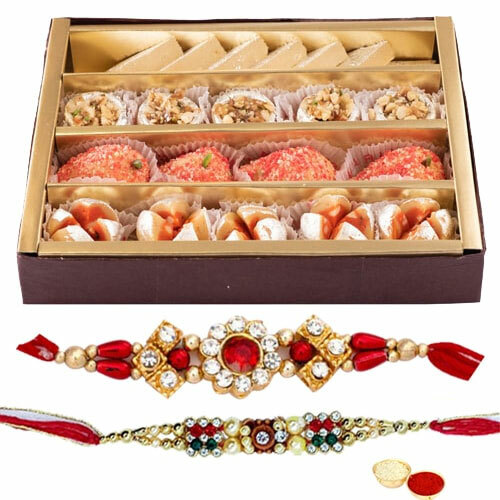 Hear your brothers saying that you are the best sister in the world when you gift them this Delectable Gift of Aperitive Sweets from Haldirams which comes with a free Rakhi, Roli Tilak and Chawal. The gross weight of the Sweets is 250 Gms. The formation of the Rakhi may comes with alteration as per the availability. Nicely Gift Wrapped 250 Gms. (Gross Weight) Assorted Sweets from Haldiram with 1 Rakhi, Roli Tilak and Chawal. Nicely Gift Wrapped 250 Gms. (Gross Weight) Assorted Sweets from Haldiram with 2 Rakhi, Roli Tilak and Chawal. Nicely Gift Wrapped 250 Gms. (Gross Weight) Assorted Sweets from Haldiram with 4 Rakhi, Roli Tilak and Chawal. Nicely Gift Wrapped 500 Gms. (Gross Weight) Assorted Sweets from Haldiram with 1 Rakhi, Roli Tilak and Chawal. Nicely Gift Wrapped 500 Gms. (Gross Weight) Assorted Sweets from Haldiram with 2 Rakhi, Roli Tilak and Chawal. Nicely Gift Wrapped 500 Gms. (Gross Weight) Assorted Sweets from Haldiram with 4 Rakhi, Roli Tilak and Chawal.